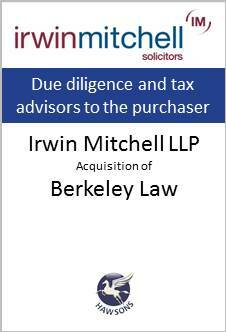 The Hawsons specialist tax and due diligence teams have worked closely with the in-house team at Irwin Mitchell, on this very important acquisition for the firm. Leading legal services group Irwin Mitchell has completed the acquisition of Berkeley Law, which specialises in wealth advice for high-net-worth individuals in the UK and overseas. This is the latest stage of plans to expand its business and increase its offering in London. Mayfair-based Berkeley Law, which began trading in 2010, has quickly established a strong reputation for providing high quality wealth services and Irwin Mitchell’s Group Chief Executive Andrew Tucker said the move would enable the group to expand its range of services for clients with complex financial affairs in the UK and abroad.